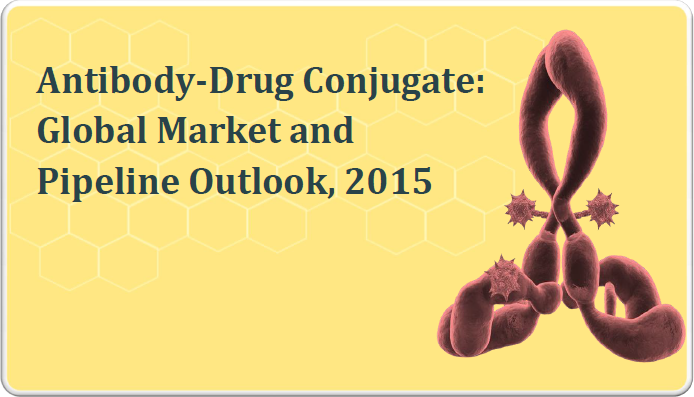 Antibody-Drug Conjugate Market Outlook, 2015 Report in Market Now! DelveInsight’s Antibody-Drug Conjugate: Global Market and Pipeline Outlook, 2015, report provides the information across the ADCs drug value chain. The Report provides the marketed and pipeline scenario of the ADCs. The Report has covered the 264 Antibody-drug conjugates profile which gives c ore information of the targets, mechanism of action, development partner, Technology partner, monoclonal antibody used, linker used and cytotoxic drug with the descriptive information of the technologies. The Report also provides the assessment of the company’s undergone collaborations for technology and monoclonal antibody and also gives insights over the pre-clinical and clinical data. The Report has also assessed the ADCs on geographical distribution based on the country and region. Antibody-Drug Conjugates are getting researched mostly for cancers. Cancer being the highest research area, there are 253 ADCs currently in pipeline. There are other companies which is also researching the ADC for different therapeutic areas like dermatology, immunology, women’s health, gastrointestinal and ophthalmology. Companies are trying its already marketed ADC for different combinations and for different indications like Roche, Seattle Genetics conducting total 9 trials on their ADCs trastzumab emantisine and Brentuximab Vedotin. There are two new ADCs AstraZeneca’s Moxetumomab Pasudotox and Pfizer’s Inotuzumab Ozogamicin for Relapsed/ Refractory Hairy Cell Leukemia and Acute Lymphoblastic Leukemia respectively. Ask for Sample Pages now! This entry was posted in Uncategorized and tagged Antibody-Drug Conjugate, collaborations, Competitive landscape, cytotoxic drug, Discovery, Global Market, licensing opportunities, market trends, monoclonal antibody, Pharma Company, Pipeline coverage, pipeline coverage and competitive landscape, Pipeline Outlook, Pipeline Reports, technology assessments, Track your closest Competitors. We DELVEINSIGHT are Business Consultant and Knowledge Partner and have extensive experience across the value chain of pharmaceutical industry. Our company can provide valuable insight across all Pharmaceutical industries which include Drug Manufacturing to API Manufacturers to Drug Research Companies. We can help you in building clients for your business and can help you in expanding your business while providing you the marketing strategies and therefore enabling you to grow revenue. Our team of experts can analyze your current business practices and streamline your processes to increase your return on investment. We have our proprietary Pharm Delve Platform for publishing multiple reports specific to Indication, Drug/Drug Classes covering the US, Europe, India, China and all emerging markets. Currently we have 900+ Reports in the market for Indications and Drugs which can be further customized based on your needs. This entry was posted in Business Consultant and tagged API, Biotech, Business Consultant, Drug, Global forecasting, Manufacturers, Market Research, Pharma, Pharma Company, Pipeline, Reports.